There are a wide variety of aircraft available from which to choose, with key manufacturers competing in each category. The most popular types and models are described below. 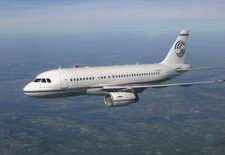 Ultra-long-range corporate derivative of the highly successful European Airbus A319 airliner. A smaller A318 (Elite) and larger A320-based model (Prestige) are also available. Ultra-long-range corporate derivative of the long established, airline-proven Boeing 737-700. The BBJ2 is a slightly longer 737-800 based version. 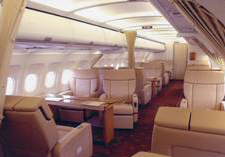 Bombardier’s trans-continental mid-size business jet. design of which owes its origins to business jet pioneer Bill Lear. of the world-renowned Mirage and Rafale jet fighters. Dassault’s outstanding three-engined super-mid-size long-range business jet. sophisticated jet fighters - and by the very same workforce - in Bordeaux. Evolved from the Bombardier Challenger, the long-range Global 5000 is only a slightly shorter version of the company’s remarkable Global Express. 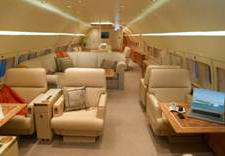 Bombardier’s largest business jet is the ultra-long-range Global Express XRS. A truly beautiful and capable aircraft. The ‘Cadillac of the Skies’, the Rolls-Royce powered Gulfstream represents one of the best corporate jets ever built. In service with many of the world’s largest corporations, the Gulfstream competes head on with the best … some would say because it is the best! The ultimate, wide-body, ultra-long-range Gulfstream 650 first flew in 2009, with first customer deliveries scheduled for 2012. A new ‘space race’ will inevitably follow. the Brazilian-built Lineage offers an attractive proposition. Indicated range and performance is dependent on aircraft model, weight, departure airport, en-route weather and other factors. E&OE. Performance, photographs and interior arrangements are representative only.